A great feeling keybed with a decent piano sound that could have offered a lot more for the money. Hammer action keybed. Decent main piano sound. Portable, fairly compact. Poor value for money. Looks aren't for us. 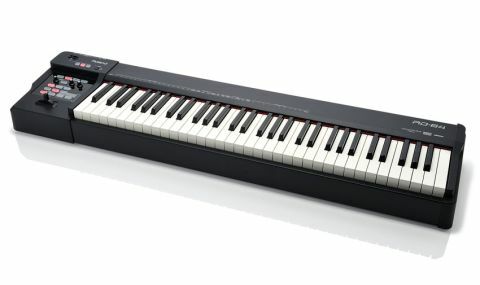 Weighing in at 12.8kg (28lbs 4oz), the Roland RD64 digital piano is surprisingly heavier than a Nord Electro 4HP but still fairly easy for one person to move. Due to the compact 64-note weighted keyboard, it will also fit into smaller vehicles (again like the E4HP). "The buttons, casing and switch gear feel solid"
We're not too keen on the RD64's looks: it's boxy and a bit plasticky with lots of wasted space on the top panel and underneath the keyboard. On the positive side, the buttons, casing and switch gear feel solid. Personally, this writer would have put all the controls in the space under the keyboard (Jupiter 80 style) instead of on the left, which would have made the RD64 shorter and even easier to transport. We would have added some real-time sliders/pads on the top panel too, but that's just us. The 64-note (A to C) Ivory-Feel-G keybed is nicely balanced beneath the fingers with a fast and precise feel. This isn't surprising as it uses the same technology found in Roland's flagship stage pianos. In fact, the RD64 has one of the nicest actions around to play piano sounds from and therefore works well as a controller for DAW related piano playing tasks too. The keys have a grained ivory like surface that helps when you're playing fast with sweaty hands, though we still think 64 notes is too restrictive for serious piano playing and would have preferred instead a 73-note board with all the controls under the keyboard as previously mentioned. "The main piano sound is great for solo piano performances or ensemble work and sounds pretty natural"
Moving on to the onboard sounds, the main SuperNatural grand (selected by the Tone Variation 1 button) is very good indeed, though one particular note (A flat above Middle C) has a weird resonance. That aside, the main piano sound is great for solo piano performances or ensemble work and sounds pretty natural on the whole. Two further variations are accessible via the tone variation buttons: another stereo piano and one in mono, too, which is always handy to have. Further shaping of the sounds can be done with the 2-band EQ and via the two EFX buttons and Reverb button. Unfortunately, these effects are basic at best and can't be edited so you're stuck with them. Surely it wouldn't have taken much effort to include a wider range of effects with a DAW editor? After all, let's not forget this isn't a cheap bit of kit we're looking at! Thankfully, the effects do their jobs well but there's just not enough choice or variation available for the money. It's handy to have the D-Beam for a hands on (or hands off) way to control sounds. Alas, there's no filter to get stuck into and no synth sounds either. As for the rest of the sounds, they're nice to have but very under whelming. The electric pianos sound good when played softly but pretty plasticky when you really start to dig in, and the organs lack a sense of authenticity with a lifeless basic tone. Although, it has to be said the onboard rotary emulation is actually very good. The clavinets are the weakest sounds of the bunch, lacking in both attack and authenticity. They should have been much better for the money and don't cut it next to the current crop of Nord's, Korg's and Yamaha's. Finally, as much as Roland is pushing the RD64 as a MIDI controller, the conspicuous lack of any real time sliders, dials or pads really stunts it in this respect. In general, there's just not enough onboard the RD64 for the modern producer and performer.